I have found that it’s best to choose a slightly darker shade than a lighter shade. It will blend in a little better than the lighter shade. Do not buy the cheapest thread that you can find. It will break much easier than better quality thread and it will also have a lot more “fuzz.” This fuzz will clump up in your machine and let’s be honest, there is enough fuzz when it comes to sewing because of all of the fibers. 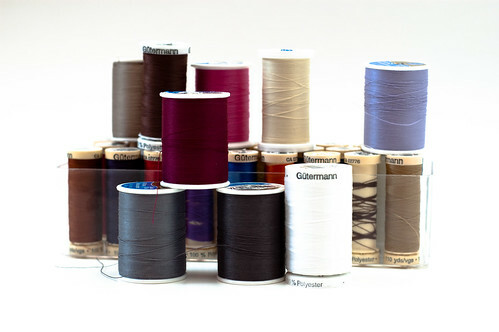 While researching I found that polyester thread is said to have some elasticity and can be used on most fabrics. It also has more strength than cotton thread but can not stand the heat as much. Honestly, I tend to use polyester thread and have not had an issue with it at all. But I would think that if you are making something that will be washed a ton you might want to go with cotton thread. I bought a small sample pack of Gutermann (100% polyester) from JoAnn’s. I also have Coats and Clark Dual Duty XP from Hobby Lobby that is decent. Honestly, I never thought that I would be able to tell the different in thread but I can a little. The cheap stuff that I have (Coats and Clark but not Dual Duty XP) seems to break more often and I can see the fibers on my machine after using it. Thanks for the shout out! I have been using Gutermann and can tell the difference. I bought a nice mix of colors all in one box yesterday for 50% off and can’t wait to use it.